1. Four days on track with an Instructor; the last two (2) days in a race car with a current annual inspection sticker. 2. Pass a written test and a technical compliance demonstration. 3. Approval of the Licensing Instructor. 5. Submit a copy of their driver’s license. 6. Submit a copy of their Physical Examination form. 7. Submit the appropriate fee. Note: The first two days of licensing school may be waived with the approval of the Regional Director for drivers with prior track experience. I immediately scheduled a physical exam, registered for the NASA competition evaluation (which happened to be the morning before the race), and fired up my PS4 to get some laps in at Sonoma Raceway. I also made a trip to Wine Country Motorsports and bought a suit and shoes. This was a great excuse to go shopping for myself. 1. I’ve spent years supporting drivers at Sonoma Raceway for Lotus Cup USA and Tom in more recent years for NASA, but never actually drove it myself. If you don’t know about this race track, it’s very technical and unforgiving. There isn’t much run off room and if you make a mistake, you can be going straight into a wall. 2. This would be my first time driving Irene on track (at speed). The only other time I drove this car was after the J32 swap was finished and we were testing at Thunderhill West during an Ongrid track day. I took the car out for one session just to make sure the car drove ok after the major transformation. Link to the test day here. 3. This would be my first time racing wheel-to-wheel, and the field of cars was very broad with lap-times ranging between 2:15s to 1:38s. This is the difference between new drivers in Miatas and experienced drivers in Prototype race cars. Focusing on my own driving was one thing, but also having to be aware of other drivers on track constantly trying to get around me was another. Also, being on a provisional license meant the race directors were watching me. In order to get my official license, I need to complete 4 races without any contact or incidents. Driving an enduro for my first race didn’t exactly give me the best odds. My evaluation was in the morning and I went out with the BMW 330i. My evaluator followed me on track to make sure I knew the correct racing line, to watch how I handled passing situations, and my overall awareness of other drivers and flaggers. I also took a written test consisting of questions from the rule book, followed by a flag test. All went well, and I received my provisional license 15 minutes before the enduro started. 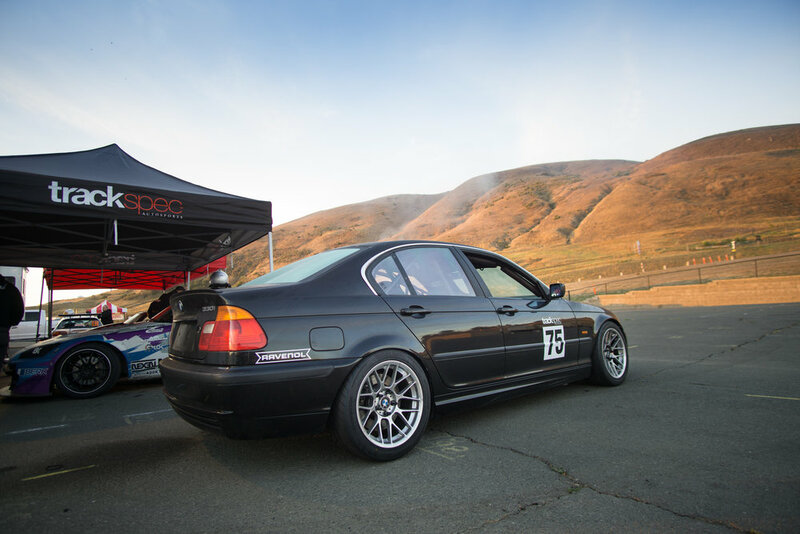 More shakedown of our soon-to-be Trackspec Autosports Spec E46 BMW race car. It's still missing the spec shocks, an LSD rear end, and spec tires. Car was on bilstein shocks with springs, Hankook RS4 street tires, and stock open diff. At 2pm, the endurance race started and Tom drove the first stint. He drove for about 2 hours and then called into the radio for fuel and a driver change. I suited up, jumped into the car, and a crew member strapped me in while two others fueled the car. We did a quick radio check, and I was off. The first few laps was about feeling the car out, and then my main focus was to drive clean and not put Irene into a wall. Twenty minutes in: The mic in my helmet stopped working and the crew on radio couldn’t hear me. This was frustrating because I wouldn’t be able to tell them when I was going to pit so that Tom could get ready for the driver swap. Forty five minutes in: I was getting hot, thirsty, and tired (I’m used to 20 minute sessions…time to buy a Coolshirt and hydration system next). One hour in: I found my second wind and I felt like I could just finish the race instead of doing a surprise pit stop. We would probably lose a lap or two if I came in and Tom wasn’t suited and the fuelers weren’t ready. One hour thirty minutes in: Irene is running low on fuel, so I decided to pit rather than run out of gas and not finish the race. As I’m pulling in, I see the crew scrambling and Tom getting into his suit. Tom jumps into the car and finishes the last 20 minutes of the race at sprint pace. There were a lot of “firsts” for me this day, and it was a lot to take in, but I had a blast! I’m proud of our team for completing our first enduro race. Looking forward to 2019! Here is some video footage of Tom and Jon during the endurance race. Tom is wearing the red gloves, and Jon is in the blue gloves.